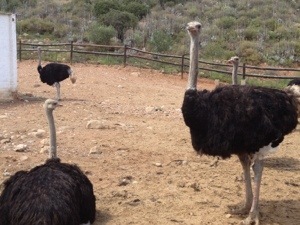 When I heard that it was possible to ride an ostrich in Oudtshoorn I was ecstatic! I have always wanted to ride an ostrich; even before I knew it was a real thing. It just sounded like so much fun! Then a couple years ago I found out it WAS actually possible. People DO ride ostriches (Not to get from one town to another of course, but that’s not the point). In fact, people actually RACE ostriches! Oh my god, too much for my little brain to handle. 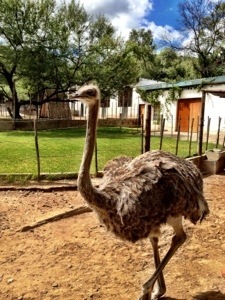 So we drove up from Wilderness, to a place called Cango Ostrich Farm just in time for a tour to begin! I was beside myself with excitement. First, we were inundated with ostrich fun facts. An ostrich has 3 eyelids, and 19 neck vertebrae (which allows it to move its neck in so many different directions at once it’s freaky). 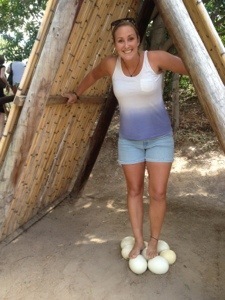 One ostrich egg is the equivalent of 24 chicken eggs! It could comfortably feed a family of 12; that is insane (Not to mention, they are incredible strong, later on in the tour we got to stand on one and it never cracked). 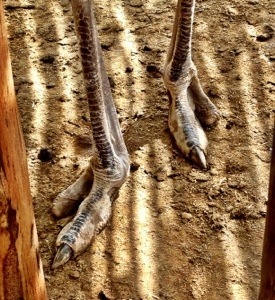 As well, ostriches only have 2 toes and one toenail on each foot. That one toenail, however, is 10 centimeters long and razor sharp. It could rip a mans chest wide open if it got the chance to. That, combined with an ostriches 75 kilometer an hour speed and its ability to kick 1.8 meters in the air, makes the ostrich a bird you don’t want to mess with. 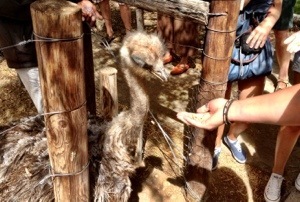 Our first ostrich encounter was with a bird called Dusty. Dusty is a fluffy, feathery little bird that probably could be mistaken as a feather duster… She is also a dwarf. At a full grown size, she still barely came up to my waist. But she was adorable. We got to feed dusty some grains as our guide explained about the different birds we were going to see. After dusty came Betsy. 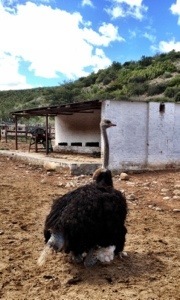 Betsy is 7 years old, and the only friendly ostrich on the farm. Apparently, you can’t tame ostriches. And usually, they are mean. Betsy was the only bird that, on her own, decided to like people from a young age. Ever since then, she loves to hang around, give kisses, and neck hugs. No one knows why Betsy decided to be friendly, but she sure is an attraction for the tourists! “Who wants a kiss from Betsy?” The guide asked. Everyone hesitated. Betsy was still pretty large for a 7 year old, and after the ‘ostriches are naturally mean’ speech we were all uneasy. “I will!” Kelsi stepped up to the plate. Oh great, well now it doesn’t sound like such a great idea. But Kelsi did it anyways. The ostrich saw the pellet, and with one, extremely swift movement, lunged towards Kelsi’s face and plucked the food from between her lips. The ostrich did peck at her lips, but no blood was spilled so it was okay. I tried soon after and the same thing happened. A quick snap, a semi-sore lip and the food was gone! Both our lips tingled for a while afterwards, but not many people can say they kissed a bird bigger than themselves! We were shown a few more ostrich tricks, then off to the races… The ostrich races that is. We all sat down on some bleachers and watched over a large pen full of ready to ride ostriches. Everyone was quiet, not sure exactly if they wanted to it not. “I do!” I jumped up with an excited smile on my face. So the two ostrich wranglers went out to hook me y very own ostrich while Shane, our guide, straightened out some ostrich myths. 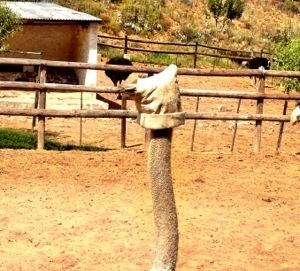 Apparently, ostriches don’t hide their head in the ground when they’re scared. However, when their head is covered, they do have the ‘I can’t see you, so you can’t see me’ mentality. So when the men caught me an ostrich, they slipped a bag over its head and the bird calmed down immediately. Then they marched him over to a wooden stand, and helped me on it. It was a weird feeling, sitting on a bird with all my weight. I had to tuck my legs under its wings and wrap my legs tight around its belly. Then I had to push myself back to the birds rear end, hold on to the wings and lean backwards for balance. It was so awkward..
“I guess so!” I said, kind of scared about what was about to happen. 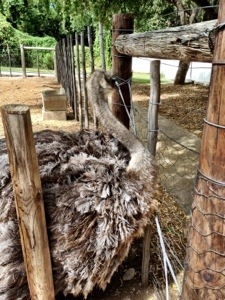 The men pulled the bag off the ostriches head an pulled him out of the wooden stand. That’s when the bird realized I was on his back and started to run. The men ran with me, shouting and hollering at the bird. I’m pretty sure I was screaming at first, then just trying to hold on for dear life afterwards. Oh my god, I’m on an ostrich! “Let go! Let go!” They yelled. 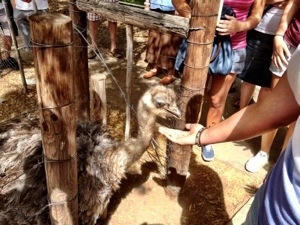 So I let go, just as the ostrich ran into a group of other ostriches. I fell backwards into the arms of the two wranglers and safely hit the ground with my feet. Ha! I rode an ostrich! The entire ride only lasted about 12 seconds, but it was amazing, and hilarious! Kelsi managed to get a video, and it’s one of the most ridiculous things I’ve ever seen. For the rest of the afternoon I was beaming. “Rode an ostrich! !” Then we’d high-five. Later I was in the car, “I think I burnt my face today Kels.” I mentioned. “No, it’s probably just wind burn from how FAST you were going on that ostrich!” She said. Then we laughed for a solid five minutes about how stupid I looked on that bird. For the rest of the afternoon I kept finding little ostrich feathers in my pants. And every time I picked one out I laughed. Another bucket list dream checked off the list! This entry was posted in Africa, South Africa and tagged Cango ostrich farm, dream come true, Ostriches, Outdshoorn, Travel by hilarylust. Bookmark the permalink. That is an awesome story! Oh man… haha I never knew riding an ostrich was a thing! I wish I could give you an award for best opening to a blog post! Hahaha! I know, it sounds ridiculous, but it’s true!! Life dream complete!! I’m writing a young adult book about an ostrich farm in South Dakota. One of the things I want to put in it is the boys trying to ride an ostrich. Thanks for the great description of riding an ostrich. It will help make the experience as real as being chased be one.